The twin trundle bed has opened our homes to friends and family without crowding out our space. 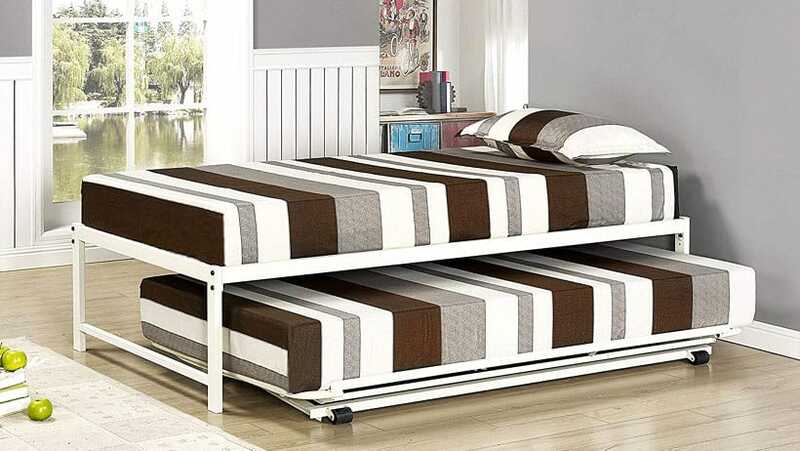 If your child is entering the age of sleepovers or if you have a small guest room where a double sleeper just takes up too much space, welcome to the world of modern rollaway beds! A standard twin bed with trundle is the perfect example of how functional furniture is changing the way we live and maximizing the use of space. No more wasted space under your mattress, only more storage options, and extra sleeper to accommodate house guests. Dating back as far as the 15th Century, it’s no surprise that its clever convenience has grown exponentially in popularity. Check out our top selection of winning single sleepers with trundles or truckles as they are also known. Our first choice is the best combination of style, space saving and storage at an excellent price. The black finish looks sleek and is beautifully finished with a head and footboard. The drawer accommodates a 6 inch mattress and includes three additional storage drawers. The design of the drawer gives the appearance of 6 compartments, but the top row of drawers just decorative as the mattress is positioned behind them. We also love that the mattress is raised compared to other trundles which are closer to the floor. This makes it more user friendly and easy to get in and out of. 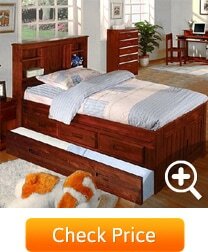 The design has sturdy wooden slat support so no box spring or additional reinforcement is needed. It is available in classic black and eggshell white. This classic design works as a child’s room or a spare bed in a guest room. There is a little gap between the drawer and the bed so little fingers are safe from pinching. 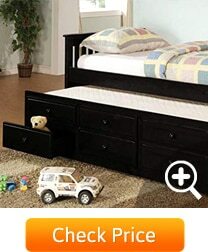 If you are buying it for a toddler, you may need to pull out the trundle to use as a step for climbing into bed as it does sit a little higher than a standard bed. Now for a little Mid-century, modern glamour with button-tufted detail in the upholstery. 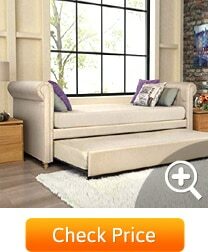 It can even double up as a backless daybed. It can be placed against a wall or used as a room divider. This design takes the prize for versatility. It comes in 4 upholstered finishes, gray, navy and tan fabric and brown faux leather. It has high sides with a gentle sleigh arch to that make a comfortable headboard or armrest. The sleeping/seating area can hold up to 400 pounds and the trundle has a capacity of 225 pounds. We recommend an 8 inch mattress for the main sleeping/seating area and 6 inches for the trundle. This stunning piece of furniture is a great fit for a lounge or a guest room that doubles up as a study, as it camouflages perfectly as stylish seating. When it’s time to welcome house guests, it provides ample space and comfort for two people. To sum it up, this is a beautiful looking piece of furniture. Incredible quality and multi-functional with a competitive price tag. If you are looking for minimalist flair for your bedroom, the simplicity of this functional design is an ideal match. The drawer rolls away seamlessly, blending in with the clean lines. Available in espresso, white and caramel latte, you can choose which finish ties in best with the styling of your room. This quality piece is made of solid wood and is easy to assemble. The roll-away drawer can accommodate an 8 inch mattress and is easy to roll in and out, even kids can roll it out and stow it away. Its low profile (16.2 inches high) makes it ideal for little kids to get in and out without help. If you plan to use the trundle as a second bed for children sharing a room, a 6 inch mattress will be a better choice. You can then leave sheets and comforter on, and roll it away without having to make it up daily. The winning feature of this single sleeper is the pop up ability of the trundle or truckle. Although it can be used in its lowered position, it can pop up to the same level of the bed, creating a spacious King sized sleeper for guests. (Mattress straps are available to secure the two mattresses together securely.) Be sure your mattresses are also the same size. The truckles clearance, which is the largest in our selection, also allows for a more luxurious, thick mattress of up to 10 inches. If you already have a 10 inch thick twin mattress that you plan to use, this is a good match for you. The trundle locks securely into position. It has two tabs that swing from horizontal to vertical position, locking the bar so that it does not pop back while in use. 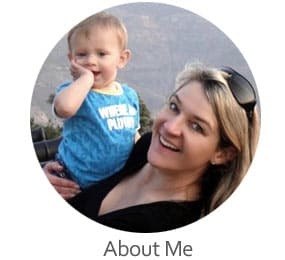 The frame is designed to handle even distribution of weight so jumping or sitting heavily in one area could cause the frame to bend. This style is the most affordable in our range. It may not look like more than a simple metal frame, but made up with pillows and sheets, it looks no different to any other bed without a headboard. The frame has pre-drilled holes should you wish to attach a headboard. This twin sizes Captain’s Bed has a unique headboard made of solid pine. The headboard is designed to be used as a bookshelf with adjustable shelves that you can arrange it to suit your needs. There are also 3 storage drawers in the trundle that create space for even more convenient storage. The wheeled drawer comfortably fits a 6 inch mattress, ready to be used for many a sleepover. The drawer is not fixed to the main structure and can be slid in from either side. It comes mattress ready with built-in base support in both the bed (11 slats) and the trundle (10 slats). The Captain’s Bed comes in an attractive Merlot and honey finish. This classic design is timeless. 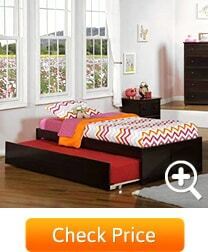 It’s the ideal piece of furniture to accompany your child from their toddler stage and onwards into their teens. The black metal framed pop up is the winner in this category, followed by the Espresso wood twin. Close on its heels is the upholstered single sleeper. It is not an easy pick as all three options have winning characteristics, so depending on your budget and specific needs, you’ll know what’s the perfect match for you. We have a tie between the black metal, pop up and the Espresso wooden bed. Both take up the least floor space of 77 x 42 inches. The very appeal of a trundle is that you get an additional sleeping space without giving up floor space when it’s packed away. The floor space you save is key, especially if your child’s room is also their playroom. The largest area is taken up by the upholstered trundle and even here, its only a minimal 83.5 x 43 inches. 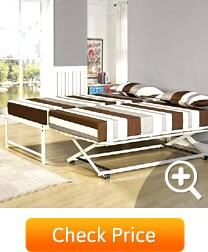 Both the White Mission Style and the Captains Bed with the bookcase headboard tick this box. We love the build in storage over and above the additional sleeping space. Although both styles come with a higher price tag, The combination of functionality makes these three-in-one pieces of furniture well worth the money. The Mid-century, modern upholstered twin trundle bed takes home the prize. Its sophisticated style comes in 4 classic finishes that are hard to beat. If you plan to style the room around a jaw dropping centerpiece, look no further.